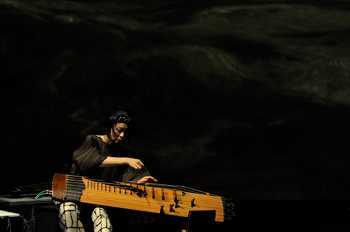 Friday, April 29, 2011 at 8:00 p.m.
341 Delaware Ave. Buffalo, N.Y.
Hallwalls is pleased to present master musician and composer Jin Hi Kim in a rare Buffalo appearance performing her extraordinary solo multimedia work Digital Buddha and more live in Asbury Hall. Jin Hi Kim is an internationally acclaimed innovative komungo virtuoso and a 2010 Guggenheim Fellow in Composition. Kim is currently the Music Alive Composer-in-Residence with the New Haven Symphony Orchestra (2009-2011). 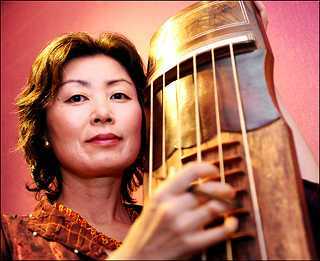 Jin Hi Kim introduced the indigenous komungo (a Korean 4th century fretted board zither) for the first time into the Western contemporary music scene through her wide array of compositions for chamber ensemble, orchestra, intercultural ensembles, multi-media, and avant-garde improvisations. She also co-designed the world's first and only electric komungo. Kim's autobiography Komungo Tango, a 25-year journey of creative collaborations with master musicians around the world, was published in Seoul, S. Korea. Kim received an Award for Music Composition from the Foundation For Contemporary Performance Art, which was created by John Cage and Jasper Johns to support innovative creative work in the arts. She is a recipient of the American Composers Orchestra Composer Fellowship, Wolff Ebermann Prize for the International Theater Institute, Mary Flagler Cary Charitable Trust, MAP fund from the Rockefeller Foundation, the National Endowment for the Arts and Meet The Composer US Commission as well as artist residence fellowships from the Rockefeller Foundation Bellagio Center, Italy, Asian Cultural Council to Japan, Djerassi Foundation, California, and Freeman Artist-In-Residence at Cornell University. An interview about Kim's electric komungo and performance were featured on KBS-TV Korean National Broadcasting System, Arirang TV -Global Broadcasting, MBC-TV, and YTN National TV in S. Korea. Kim's komungo solo works represent an evolution of the instrument into the 21st century. Her mesmerizing new komungo compositions are imbued with a meditative and vivid energy. Kim has created live interactive performance pieces with a MIDI computer system using MAX/MSP. Kim's new direction of komungo solo recital, Digital Buddha is a 70-minute multimedia performance featuring video mixed with extraordinary juxtapositions, fast cut swirling images of a deconstructed electric komungo, and more. The ongoing project has been presented at Korea Festival, Festival Dos Abrazos (Spain), Expo Cibao (Dominican Republic), Expo Zaragoza (Spain), Art & Ideas Festival (New Haven), Detroit Institute of Arts, Festival Salihara (Indonesia), and many other places. In three decades of creative activity, she has worked in improvisational forms with traditional music masters from Asia, India and Africa and performed in a free improvisation context at many international festivals with prominent Western avant-garde improvisers. Kim's cross-cultural works lead to new directions, incorporating a profound Asian cultural heritage with a balance of Eastern and Western aesthetics. Her intercultural collaborations utilize ancient Asian traditions of drum, voice and mask dance with contemporary aesthetics and Western technology: Dong Dong Touching The Moons, a 70 minutes long multi-media lunar ritual, won the Wolff Ebermann Prize for the International Theater Institute Conference in Munich, Germany. Kim's widely acclaimed 90-minute cross-cultural mask dance drama, Dragon Bond Rite, featured musicians and dancers from India, Indonesia, Korea, Japan, Tuva and the U.S., Both productions were presented at the Kennedy Center (Washington, DC) and international venues.